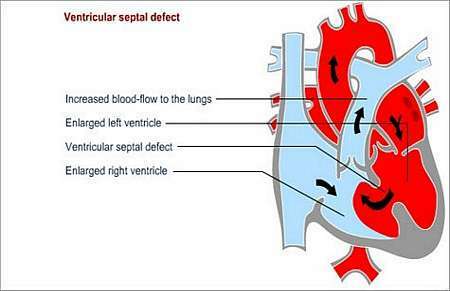 What is a VSD (ventriculo-septal defect)? chambers (ventricles). This defect allows blood to pass from the left ventricle (high pressure; oxygen-rich blood) to the right ventricle (lower pressure; low oxygen levels in blood) and increases blood-flow through the lungs. The blood that is shunted from the left ventricle to the right ventricle overloads the right ventricle and the pulmonary vascular bed (blood vessels in the lungs). In addition to the shunted fraction of blood through the VSD, the left ventricle still has to supply the bodys normal blood-flow requirement. This and the higher than normal return through the pulmonary circulation also causes volume overload of the left ventricle. 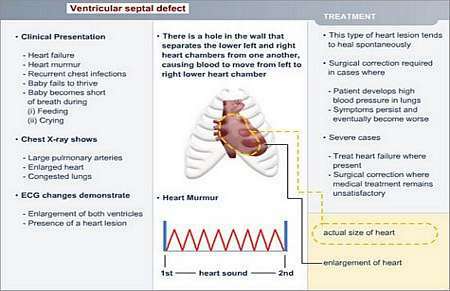 Ventricular septal defect (VSD) is the consequence of a birth defect. The condition may damage the blood vessels in the lungs because of the higher volume of blood that is pumped through the pulmonary artery, by the right ventricle, to the lungs. Volume overload of the left heart occurs because the left ventricle pumps blood into both the systemic as well as the pulmonary (lung) circulation. There is an increased return from the higher flows through the lung as well as a higher required forward flow through the added burden of the VSD. In addition, there are changes in the pulmonary blood pressure and vasculature, resulting in high pulmonary blood pressure, which may eventually cause pulmonary vascular disease. Pulmonary vascular disease causes obstruction and increased resistance to blood-flow in the lungs. When the condition becomes irreversible, the life expectancy of the child becomes severely compromised. Symptoms may often not appear until several days or even weeks after birth. Many children with VSD do not need surgery. The VSD may close spontaneously during the first 5 to 7 years of life, or it may be too small to cause real damage to the heart and lungs. When spontaneous closure does not occur (the hole may be too large to close by itself), surgical corrective procedure will be required in childhood. 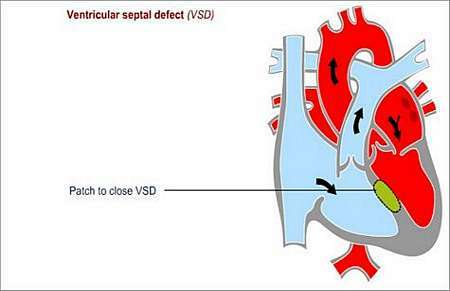 It is unlikely that a patient with a VSD will function normally as an adult; this will only be possible if the patient has another congenital heart defect to compensate for the VSD. This surgical procedure is used to temporarily postpone the effects of a VSD in cases where the VSD or multiple VSD cannot be repaired due to technical reasons or associated cardiac lesions. The pulmonary artery is narrowed with a band to restrict blood-flow and reduce pressure in the lung circulation and will help the child to grow. At a later stage, a full corrective procedure may be performed. Surgical repair is indicated when the child has a significant VSD with failure to thrive, heart failure, or if there is an unacceptable increase in pulmonary blood-flow or pressure. The hole is repaired by stitching the edges of the hole together, or be covering the hole with a patch. Outpatient check-ups will be required once every two or three years. During these follow-up assessments, certain special investigations may be required e.g. Endocarditis is an infection of the inside lining of the heart or heart valves. The patient needs to take precautions to prevent endocarditis before surgery and for up to six months to a year afterwards.